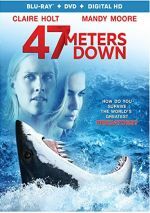 2017’s 47 Meters Down provides a tale of survival among sharks. Sisters Lisa (Mandy Moore) and Kate (Claire Holt) take a vacation to Mexico together, and part of the trip revolves around water-based activities. One of their choices? To hop into a safety cage that gets submersed in the ocean and allows them to view enormous sharks from up-close. This doesn’t go well. The cable that attaches the cage to a boat snaps and sends the enclosure to the bottom of the sea. As their oxygen slowly expires, the sisters attempt to escape and survive. When a movie about sharks appears, it seems natural to compare the tale to 1975’s Jaws. 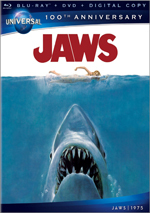 After 42 years, Jaws remains the definitive movie in this genre, and I doubt that status will ever change. In this case, though, it makes more sense to view Meters in terms of how it relates to a 2016 release: The Shallows. Whereas the stories of Jaws and Meters don’t have a lot in common, Shallows and Meters share more than a few factors. Which can make Meters occasionally feel like an attempt to capitalize on the moderate success of Shallows. Production schedules make this unlikely, as I’m sure Meters was already in the can when Shallows hit screens, but the similarities clearly exist. Unfortunately, those comparisons don’t extend to the quality of the films. While Shallows provided a stimulating “woman against nature” tale, Meters seems much less interesting, as it leans on genre tropes too often. This means Meters lacks much creativity, and it can be awfully contrived. It takes an “anything that can go wrong will go wrong” approach that becomes nearly comical at times. The sisters suffer through so many equipment breakdowns and related failures that the result seems absurd. The filmmakers work so hard to place the characters in danger that the movie loses a lot of potential impact. Meters also goes completely off the rails in its third act. I don’t want to provide spoilers, but suffice it to say the movie delivers a “fake-out” ending that seems irritating at best and cruel at worst. It’s a gambit that doesn’t work, as it just makes the viewer unhappy. It’s cleverness for its own sake and it harpoons any potential good will. Not that the movie had all that much charm to squander. Yeah, 47 Meters Down manages a few decent shark-related scare moments, but those don’t sustain interest across its brief running time. The overall package seems thin and silly. 47 Meters Down appears in an aspect ratio of approximately 2.35:1 on this Blu-Ray Disc. The movie offered pleasing visuals. I saw no shimmering or jagged edges, and edge haloes failed to appear. As for source flaws, the image lacked specks, marks or other issues. Colors appeared good. With the tropical setting, I expected peppy tones, and those resulted – despite an apparently inevitable tendency toward orange and teal, the hues were well-developed. Blacks looked dark and deep, and shadows were smooth – within the limitations of the underwater shots, that is. The image was good enough for a “B+“. I also felt positive about the pretty good DTS-HD MA 5.1 soundtrack of Meters. The ocean setting offered nice use of the side and rear speakers, especially in terms of aquatic ambience. These elements filled out the speakers in a fairly involving manner. Audio quality was fine. Speech usually seemed natural and concise. Effects depicted the elements with acceptable accuracy and boasted pleasing low-end when necessary. Music showed reasonable clarity and range, and they also packed solid bass response at times. This was a perfectly appropriate mix for the material. The disc’s extras open with an audio commentary from writer/director Johannes Roberts and producer James Harris. Both sit together for this running, screen-specific look at the project’s origins, development and unusual path to multiplexes, cast and performances, effects, sets and locations, shooting underwater, and related topics. Overall, this becomes a good commentary. I was eager to learn more about why Meters avoided its original direct-to-video fate, so I like those elements, and other aspects of the chat add solid information. Roberts and Harris turn this into a likable piece. Unexpected Originality: The Making of 47 Meters Down runs 11 minutes, 12 seconds and includes notes from Roberts, Harris, producer Mark Lane and actors Mandy Moore and Claire Holt. It covers story/characters as well as visual effects, cast and performances, and aspects of the underwater shoot. “Originality” becomes a decent overview of the production. The disc opens with ads for Open Water 3: Cage Dive and Deepwater Horizon. No trailer for Meters appears here. Though it comes with the occasional jolt, too much of 47 Meters Down seems cliché and contrived. The movie can’t rise above its genre origins to bring us a vivid tale. The Blu-ray offers very good picture and audio along with a couple bonus materials. Meters does nothing to enliven the shark attack genre.